Spring is officially in full swing here in Dallas, and with the warmer weather comes the chance to spend more time enjoying the outdoors in the comfort of your outdoor living space. If the winter has kept you from enjoying your Dallas patio or outdoor living space, there is likely some spring cleaning that will need to be done before you begin relaxing or hosting gatherings in the area. Make spring cleaning an outdoor affair and transform your patio into your go-to space for both relaxation and entertaining with these helpful tips. The winter weather can really take a toll on your outdoor patio. The conditions can steer dead leaves, branches, stones, mulch, and other debris onto the floor of your outdoor living space. As part of your spring cleaning routine, make sure to clear any debris from the space. Remove all furniture from the space and clear up any leaves, branches, and dirt you see. Clearing debris from your outdoor living space restores utility to the exterior of your home and will make the area far more enjoyable. Tip From Our Dallas Patio Contractors: If the floor of your outdoor living space is dirty, after clearing debris, give your patio area a thorough cleaning with a power washer or a scrub-brush. Whether you left your patio furniture outside or stuffed it into storage during the winter season, chances are it is going to need a little TLC. Before you put all of your patio furniture into its proper place, give them a good clean. If any of your patio chairs have cushions, you can start by removing them and fluffing out the dust and dirt. For a deeper clean, use a household cleaner to scrub the surfaces of the cushions. Most outdoor furniture can be sprayed down with a hose and then wiped down with a cleaner to achieve the optimal cleanliness. If there is any patio furniture that cannot be brought back to life with a gentle cleaning, consider replacing it. 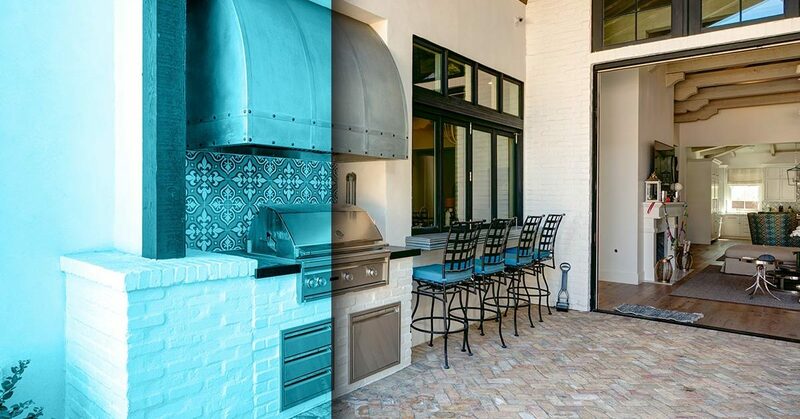 If your outdoor living space has an outdoor kitchen, an outdoor fireplace, or any other outdoor appliances that have not been used in a while, it is important to take a quick look at them to ensure they are in working condition. Before using any of these appliances you should first make sure that all the wiring is intact, outlets are free of debris, and gas lines are undamaged. Once it is confirmed that all of these vital hookup points are safe and operational, move on to the appliances themselves. Clean out grill grates, refill propane tanks, check outdoor sinks for rust and other damage, and inspect outdoor fireplaces. Spring is the perfect time to add some entertainment upgrades to your outdoor living space. If you do not have one already, perhaps consider adding a swimming pool near your patio to add another area that can be used for fun and relaxing. Add an outdoor bar to your patio space and make some of your favorite cocktails and beverages or add a flatscreen TV so you will never have to miss a game — the entertainment options you can add to your outdoor living space are seemingly endless! By following the above tips, you will be left with an outdoor living space that is better prepared for the warmer weather ahead. While your neighbors will still be clearing out a winter’s worth of indoor clutter, you will be outdoors enjoying the early beauty of the spring, already ready to grill, play, or simply sit in front your patio fireplace and relax. If you are interested in adding to your current space or want to build an outdoor living space for your home, there is not a better team of Dallas patio contractors to work with other than those at Compass Outdoor Design. With years of experience designing and building outdoor living spaces, we can help you achieve the patio of your dreams. If you are interested in learning more information about our patio design services or want to begin designing your luxury outdoor living space, contact us for a free estimate!